Markham, Ontario – Environmental responsibility is a requirement for many travelers when they select a hotel. Maestro PMS understands this and encourages it. With 40 years of established practices bringing the latest property software technology to the independent hospitality space, Maestro has led the paperless movement for the last 10 years providing technology solutions that support sustainable hospitality practices. Maestro's most recent property software innovations reduce paper use and simplify the guest journey. Maestro's Mobile Check-Out capability streamlines property operations and eliminates the need for paper folios or visiting the front desk. "Today, sustainability has become the defining element of both trendy urban properties and stylish beach resorts," said Albert Herrera, senior vice president of Global Product Partnerships for Virtuoso, a luxury travel network. "Many Maestro PMS users are independent operators committed to running their properties in ways that protect the environment. Maestro works with these operators to create responsible system processes that support their sustainability goals," said Warren Dehan, Maestro PMS President. Maestro PMS' automatically emails content-rich reservation confirmations, pre- and post-stay emails to guests. The system's mobile check-in and digital registration eliminates the need for hardcopy registration cards. Maestro's new Mobile Check-Out lets guests review their folio on their mobile device or on a tablet from anywhere they may be. 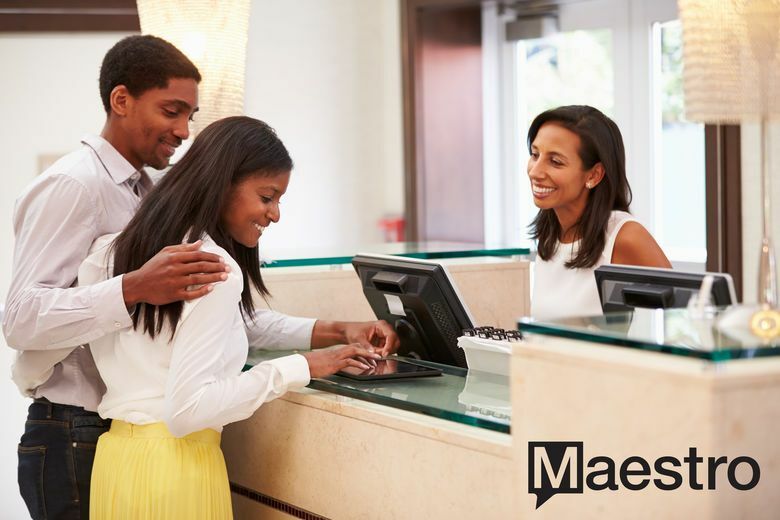 For guests who visit the front desk to checkout, Maestro's Tablet Folio Review feature allows guests to read their folio for final approval on a front desk tablet. Necessary corrections may be made digitally and the final folio emailed. "Many properties print a hardcopy folio for guests to review, then print a second folio as each guest is checked out of the system. There is no need for these printouts with Maestro, the entire process is paperless," Dehan said. Maestro also supports electronic funds transfer (EFT) to further reduce paper use, and the system supports electronic scanning of guest identification to eliminate photocopies. Another big reduction in paper use comes from Maestro's paperless reporting that lets properties export to Excel and PDF reports for on-screen viewing and digital archiving. Further, Maestro's Spa & Activities Management System utilizes tablets for customer registration intake forms; ending the need to manually rekey data from paper forms filled out by most spa clients. Paper saving has also been extended to Maestro's Sales & Catering system which supports electronic document signature for group business contracts. Maestro also eliminates hardcopy comment cards with its Guest Experience Measurement (GEM) survey tool. GEM has the added advantage of automatically transferring guest comments and preferences to a guest's history profile for more personalized interactions. "Plus, Maestro enables managers to send housekeepers a mobile version of their schedule. This ends the need to create hardcopy duty sheets for each housekeeper," Dehan said. The Maestro Property Management System (PMS) delivers flexible and scalable deployment options with a feature identical web browser or windows solution available in the cloud or on premise. Maestro's revenue-generating property software tools and services increase profitability, drive direct bookings, centralize operations, and provide personalized and mobile guest service tools to enhance the guest experience. Click here for more information on how to engage and socialize with Maestro PMS.